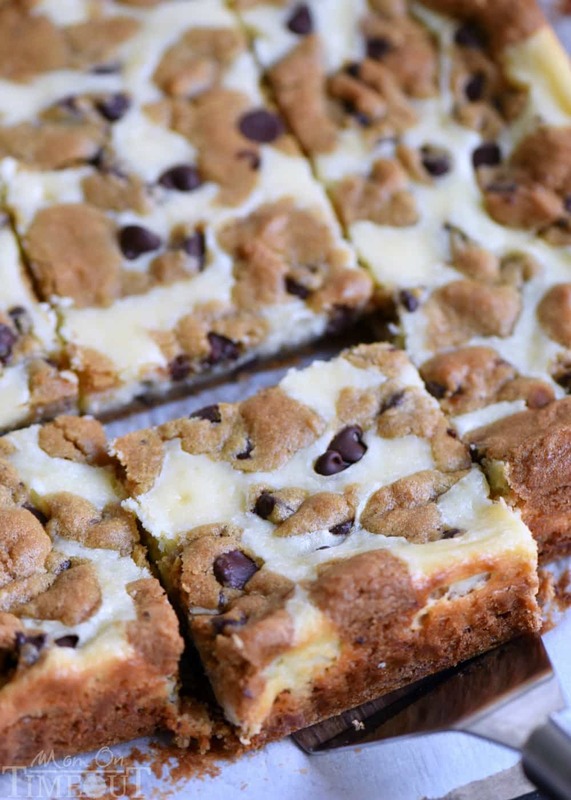 These easy Chocolate Chip Cookie Cheesecake Bars are made with just five ingredients! 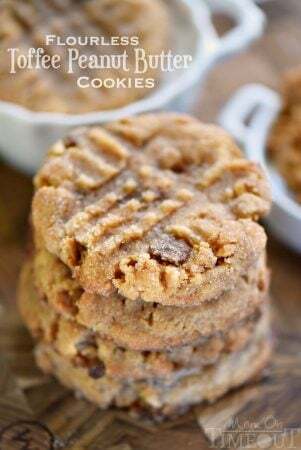 This easy dessert recipe will satisfy all your cravings and is PERFECT for parties, bake sales, cookie trays and more! Love cheesecake? Make sure to check out our Cheesecake Chocolate Chip Muffins and Dutch Apple Pie Cheesecake Bars – the best! 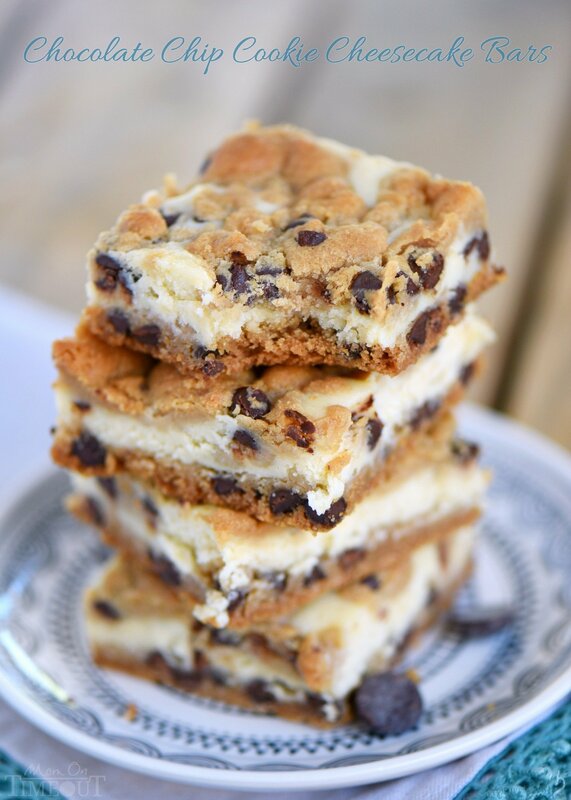 Let’s go ahead and combine two of my favorites today: chocolate chip cookies and cheesecake. With the help of refrigerated cookie dough, you have an incredibly easy and delicious dessert in no time at all. Because I’m all about options, please feel free to use your favorite homemade chocolate chip cookie dough in place of the refrigerated dough. This also allows you to add nuts or other add-ins should you desire. 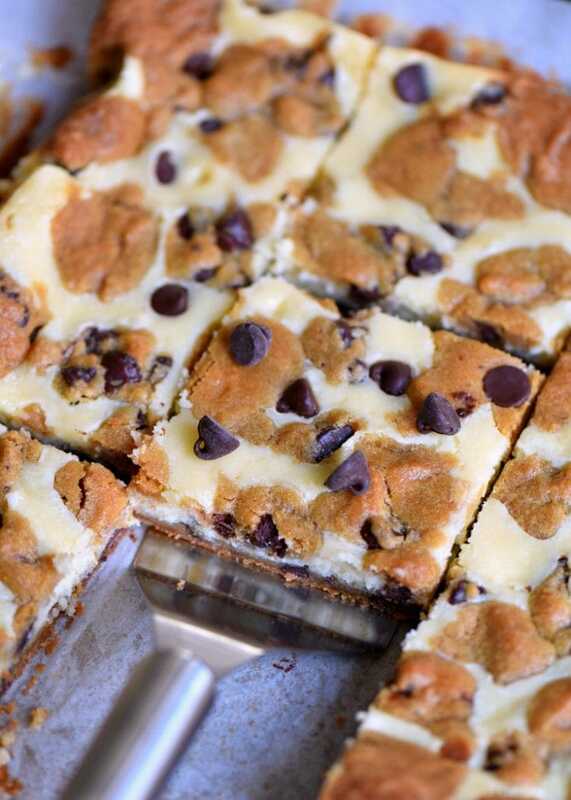 So let’s talk about these cookie bars. 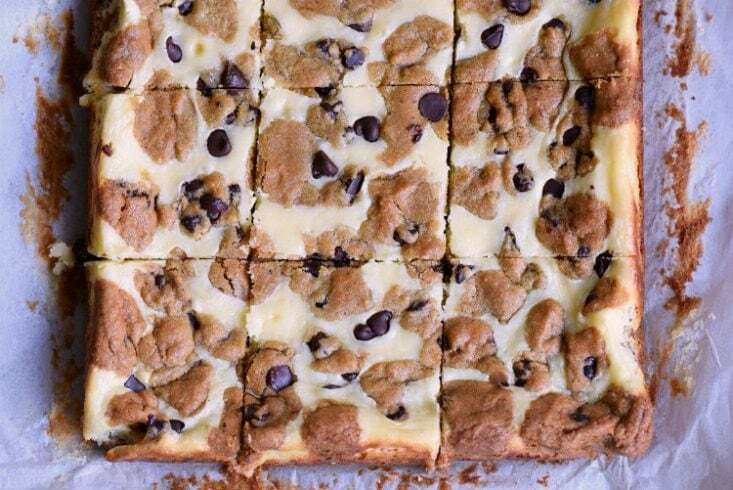 I’m kind of in love with cookie bars in general. 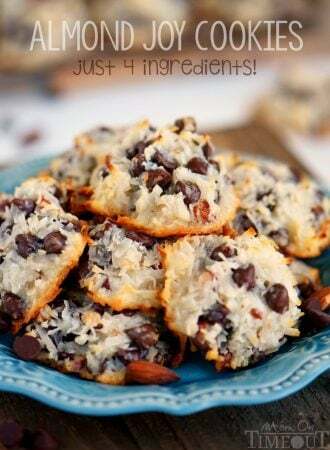 They are so much easier to make than actual cookies! No scooping and batch baking – everything happens at once. These bars do need to cool to allow the cheesecake layer to set up, but boy are they worth the wait! 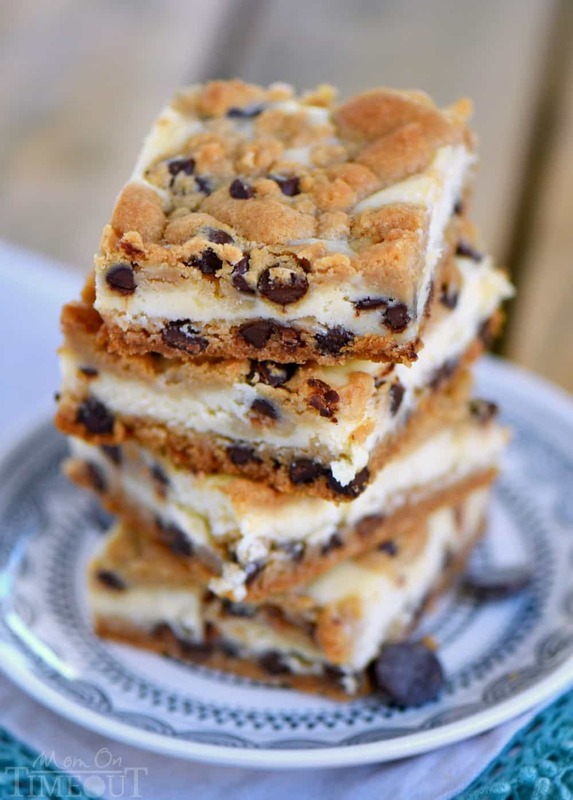 cream cheese – I used the full fat cream cheese for these easy cheesecake bars. You can however use reduced fat cream cheese if you prefer but not fat-free. It just won’t turn out right. Instead of making cheesecake in a springform pan, cheesecake bars are made in 8-inch, 9-inch or 9×13 baking pans. This makes them easier to cut into bars. Like traditional cheesecake recipes, cheesecake bars often feature some sort of crust. 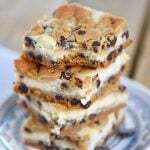 In these Chocolate Chip Cookie Cheesecake Bars, I’m using chocolate chip cookie dough as the crust. It makes the cheesecake bars easier to hold and handle. I’m not sure there are two things in my life that I love more than chocolate chip cookies and cheesecake… Straight up awesome. I made these cheesecake bars in a 9-inch square pan. You can use an 8-inch square pan if you want slightly thicker bars. Add 2 minutes to the baking time. Make sure to let these bars chill completely so they cut up cleanly. Clean your knife in between cuts as well. Use high quality refrigerated cookie dough for the best results. Line a 9-inch square baking dish with parchment paper or non-stick foil. Set aside. Spread a little more than half of the cookie dough onto the bottom of the baking dish and press down firmly creating an even layer. Using a stand mixer or hand held mixer, beat the cream cheese until light and fluffy. Add in the sugar and beat until combined. Pour the cheesecake filling over the top of the cookie dough base. « Easy Chocolate Crescents – Just 4 Ingredients! Absolutely the most delicious and quickest cheesecake ever made. I like my bars to be a bit more on the well done side so kept cake in oven 45 mins instead of 30mins. Yummy thanks for this receipt. My family loved them. 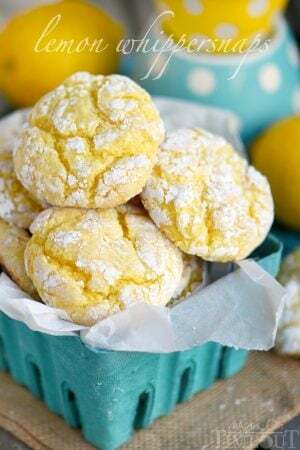 Recently, I made a recipe for almond shortbread where they substituted cornstarch for some of the flour and the result was great so I was comfortable using it in this recipe.The cream cheese really made the difference. They baked in 8 -9 minutes and were perfect. Making them this weekend for a group of friends. Yes they do need to be refrigerated. Thanks Val! 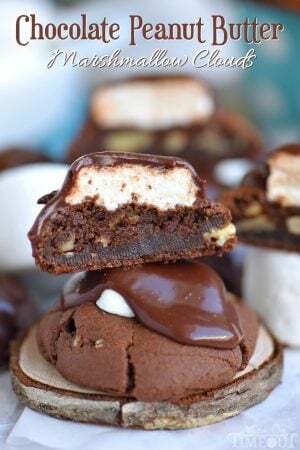 These look yummy! Can you use a 9×13 inch pan for this recipe? The recipe says to cool thoroughly, does that mean cool at room temp or refrigerate before serving? So if you double batch it – how long do you need to bake this for? I was thinking of using a 9×12″ glass pyrex pan lined with parchment. Please let me know – I wouldn’t want to under bake! Thanks!